Meet Bob. 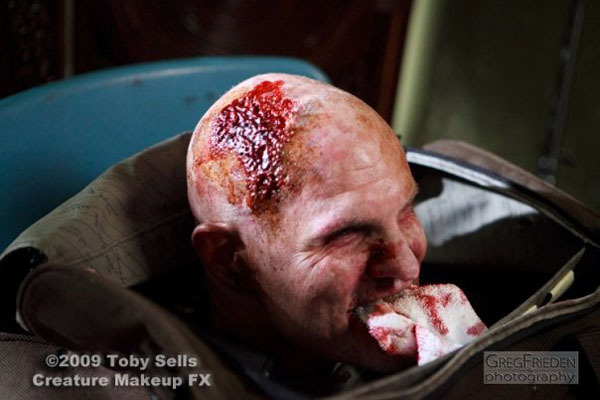 Bob is a severed zombie head. In Collapse, the upcoming zombie apocalypse movie now filming in Iowa, main character Robert (Chris Mulkey of Saving Grace, Cloverfield, North Country, Radio) carries our little buddy “Bob” around with him. 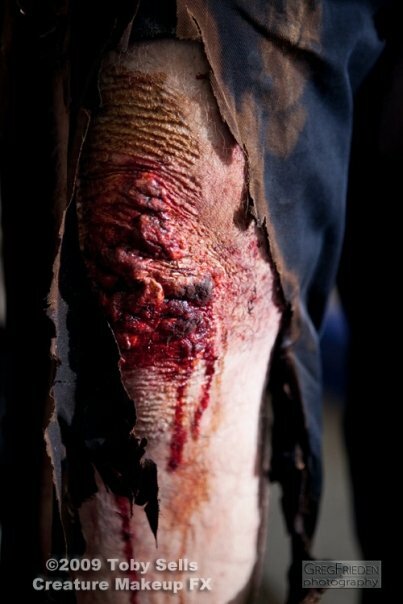 Find out more about Bob, and see six more images of the zombies of of Collapse, after the break. At one point in the film Robert, the lead character, finds the zombie head a sink. Robert attempts to drown the head by filling the sink with water, but it floats and bobs on the surface. He tries to hold it under the water, but since it doesn’t breathe, it has no effect. 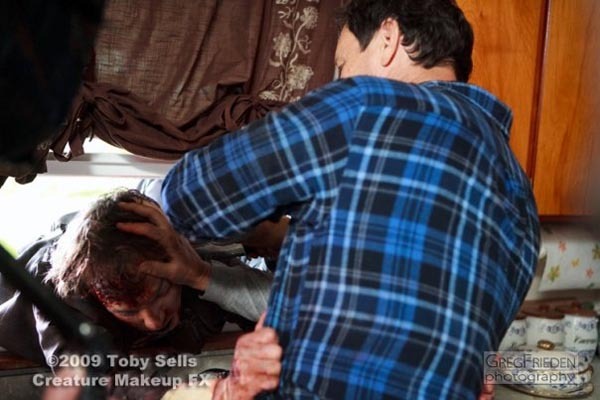 Robert decides to take the zombie head with him instead of shooting it. He shoves a sock in its mouth and stuffs it in a bag for easier handling. Seems like a good plan, especially since there’s been a severe lack of severed-head zombies on the silver screen since ReAnimator. 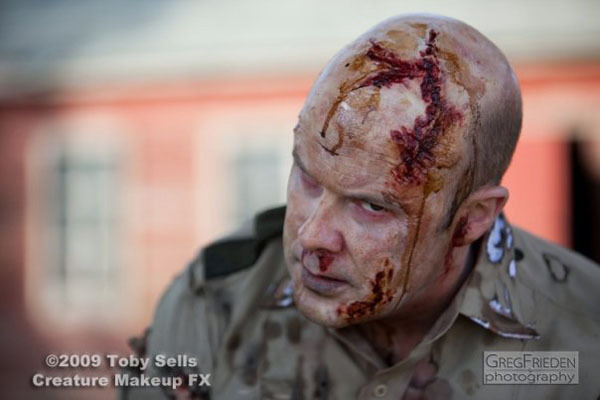 And I have to say, all these zombies look pretty damn good. 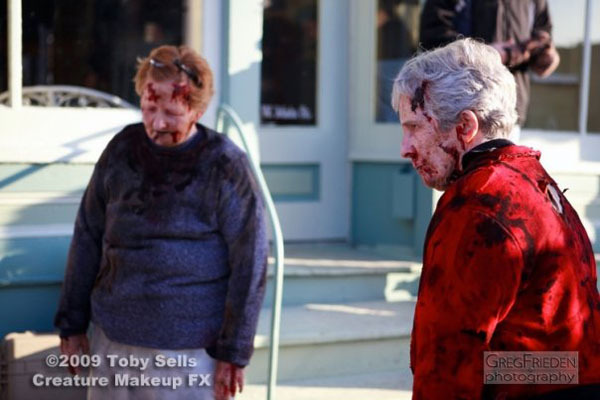 They’re the work of Toby Sells, the make-up and special effects artist for Collapse, who’s also worked on eight other zombie films including Zombieland. Nice work, Mr. Sells! You can find more info and images on the official Collapse Facebook page. Got to be a part of this on October 14th, cast as one of the undead. The Cast and crew were a ton of fun, and Toby and his crew are fast and extremely talented! 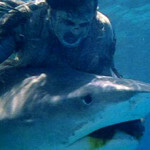 This is one of those things that you look back on and say “Yeah, it was amazing to be in something like that.” Catching a brief synopsis of the plot from the director, I would have to say that the story is a must for Zombie Aficionadoes as well as mainstream film lovers. Low budget or not, this seems like an act of love from the people that I worked with. When I spoke with Karen Landry (Tom Mulkey’s real life wife and wife in the film) she had this to say: “I’ve never been a horror buff, but working on this is a real treat. I’m enjoying myself far more than I expected myself to!” Can’t wait to see the finished project. And I’m not so sure that it’s a low budget film. 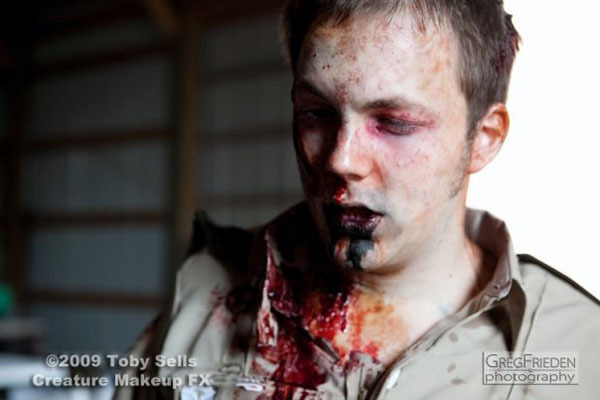 They seemed to be putting a lot of attention to detail, and Toby would not let his Zombies out the trailer door until they were exactly as he wanted.